At age 21 I’d managed to acquire and dispose of four cars. 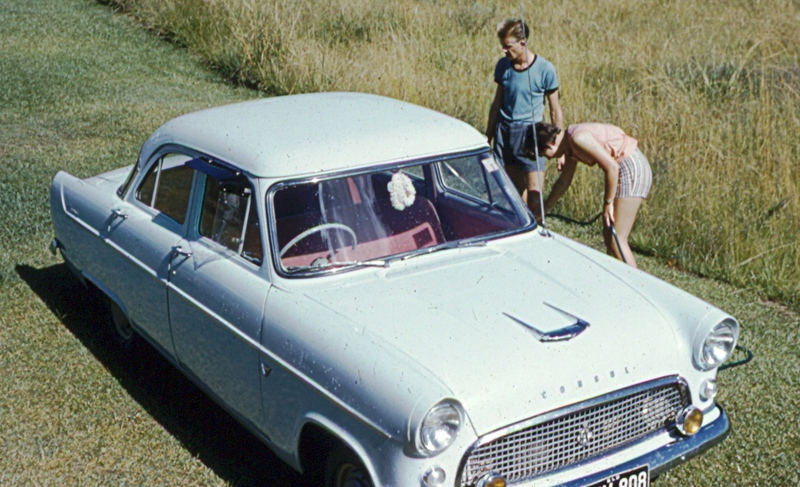 The oil burning Vauxhall, my first car, had given way to a more sedate Hillman Minx at the urging of those who’d been caught in the blue smoke contrails the Vauxhall emitted. However my national service army training soon gave me a taste for a more rugged vehicle, so an army mechanic friend traded me into a Land Rover, British version of the Jeep. The brief time I possessed that blue delight was one of the highlights of my teenage years. It certainly had appeal to the young and foolish society of which I was a fully paid up member. With canvas roof cover removed it was a permanent home to crowds of teenage boys and girls who, after each day of work had been completed, went looking for fun. Loaded we climbed impossible slopes and crashed our way through the coastal wallum country trying to outrace kangaroo and emus resident there. Often we’d find ourselves sunk in some impassible crevice, all wheels desperately spinning in a vain attempt to move out of captivity. Fortunately we travelled in Land Rover packs, and part of the fun was in hitching a steel rope and dragging the disabled vehicle out of confinement. But first torture had to be applied, with the remainder of the pack still mobile speeding out of sight, supposedly leaving the wounded vehicle and occupants to fend for themselves out in the wilds. But soon they’d return whooping with joy at the opportunity given to tease occupants of the jeep left behind and we’d soon be back on track running with the pack. I worked for an accounting firm, and as some of you will know old accountants tend to be a mite conservative. I’d not been molded to their taste yet, but as I moved toward my twentieth year the partners figured it was time to tame me and make me over in their image. Vague hints were put out about partnership when I’d passed all the exams and was considered by them to be “qualified.” That was a bit of a puzzle as I’d been assigned clients to care for already and couldn’t see what advantages their hinted benefits of qualification would bring. They gave me a glimpse of the joys ahead by substantially raising my wages, and presenting me with a Ford Consol in conservative blue. As a further inducement they transferred me to their rural branch where I was to look after clients in that area after giving me advice on image, and the means to acquire it. I made friends with the young professionals in the town of Murgan. As this was a rural centre there was really nothing to occupy these young professionals after they’d finished work each day, so they made their own fun. In spite of my brief army training I wasn’t into the drinking scene, but everyone I got to know there was. There was nothing else to do in that town, and it was one way for them to deal with their boredom. I was invited to every evening party as it was soon learned there was an advantage in having me there. I could drop them off at home when they were unable to drive themselves, and there were times I had to not only get them home but deposit them on a couch or bed so they could sleep if off and be ready for work next day. I was always amazed to see them at their desks next day in various banks and businesses looking in good shape after their prior evening abuse. If it wasn’t a party it was a dance. The routine was 5.50 am off to work, back to the boarding home for breakfast at 8 am, then off to country centers in the area for tax and audit work, returning in the evening to pick up my assigned group for the evenings party or dance after a brief sojourn back at the boarding house for a 2 – 5 am sleep. So you’ll not be surprised to know that after a year of that less than intelligent program my body began to sag and my mind play strange tricks on me. The partners watched this with alarm and pulled me back home to the head office giving me pointed advice and a further steep advance in salary to get me back into focus. They were not impressed that I’d exchanged my conservative blue Ford Consol for a racy Morris with less conservative colors either. I accepted the money gratefully and decided to modify my after hours entertainment. The future was beginning to show some possibilities and I really didn’t want to disturb those salary advances. My lady love had also become a mite disenchanted with me at that stage, so I felt obliged to spend evenings into the wee hours trying to reverse that disenchantment. Unfortunately that did not work out. My parents owned a large home and my room had its own entry doors. Coming home one early morning I coasted silently to a stop in order not to disturb my dear Mother who took a keen interest in my state of health and was likely to quiz me closely at breakfast time. To my horror I found my door locked. I’d forgotten to leave it unlocked in my hasty departure, and all other doors on the front verandah were securely locked too. It was unthinkable that I should ring the bell and summon one of my parents to let me in. Sleeping on the verandah was out of the question as it was too cold. Then I thought of the small windows above the others which were always left partly open for air circulation. Yes, tentative trials showed I could climb in through one of those windows, and if this was done carefully, feet first, I could be in bed in a jiffy. With a crash I landed on the inside, our venetian blinds providing a loud tune as I played them on the way down. I was angry! Stomping around the house I made for the bedroom and noisily got myself ready for bed. No one stirred. The occupants slept soundly on. So I decided on a trip to the bathroom before retiring and that’s when I tripped over the parrot’s cage. The cage fell, I tripped, and the parrot screamed with fright. “Is that you Ian,” an urgent voice called from the inner sanctum. My cover was blown! Soon after that event I decided living in the fast lane was not the smartest thing one could do health wise. My Mother constantly reminded me. “You can’t burn the candle at both ends!” I was beginning to see the wisdom of her words. So I decided to go back to school and further my education to the amazement of my employers and the joy of my Mother. I was promised more money if I’d stay, but common sense kicked in and I headed off to College. I use to hear that same words of wisdom from my dad when I’m faced with so much choices and I want to do them all. Yes, getting a higher education gives you more choices on the job market. Oh, Ian – I think your Dad had it really tough – the Depression, man that was a nightmare from what I gather. If I may be allowed to say this: From what little I know of you – your Dad did very well, I reckon. You’ve travelled and seen much – and that empathy comes through in your writings. Lee Kuan Yew is one of my great heros. I believe everything he did was for the benefit of his people and the strength Singapore has to this day, and the admiration with which your country is viewed by the world at large is largely attributed to him and the natural inclination Chinese people have to work together for the common good. What interesting teen years you’ve had. Sounds like lots of fun. I know some guys here during the 1970s who mirrored this life…but not me. Sounds like my Dad’s experience. His father left home when he was just 12 years old and he became the father figure for his brothers. He had to claw his way up during depression years of the 1930s putting fresh cardboard inserts in his shoes with holes so he could tramp around trying to sell to support his family. However by the time of his death he could look back on a successful politician and sportsman. It is only after I was well matured I realized how fortunate I was to have such a caring nurturing father.